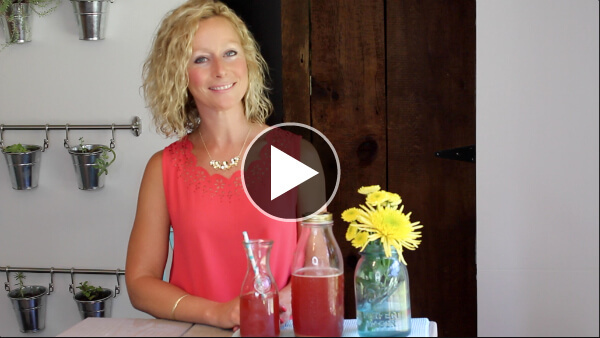 In this week’s post and video, I’m showing you how to make an easy probiotic drink. It’s way easier than making Kombucha or Kefir. No scary, alien looking SCOBY’s to deal with and no multiplying kefir grains! 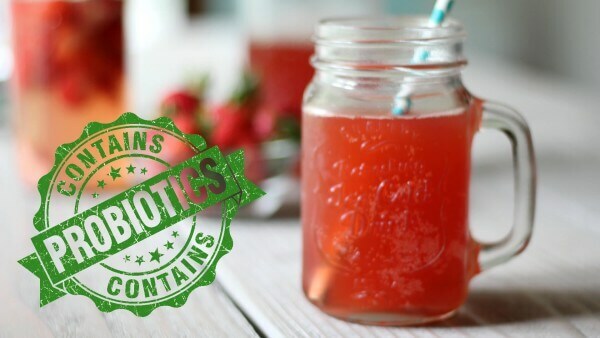 If making kombucha has intimidated you in the past, I hope you’ll give this easy probiotic drink recipe a try. It’s SO simple – anyone can do it! This easy probiotic drink is also really tasty. It’s a little fruity and a little tangy and it’s even kid approved. 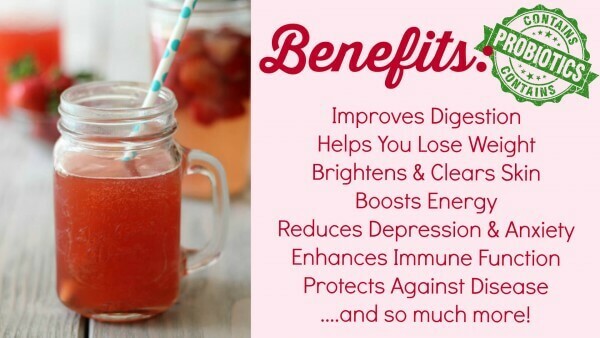 But the best part about this drink is that it’s loaded with probiotics, which are beneficial bacteria that are SO crucial for good digestive health. I’m excited for you to try this recipe and experience it’s many benefits! As you can probably tell from the video, I’m incredibly passionate about digestive health and taking charge of gut bacteria 🙂 That’s because your digestion is the very center of your health! If your digestion isn’t working properly, NOTHING else will work optimally! You’ll have trouble losing that stubborn belly fat, your hormones won’t be balanced, you won’t have enough energy, your skin won’t be bright and clear and the list just keeps going. The latest science is even showing that things from autism to obesity, from allergies to autoimmune diseases, from Parkinson’s to depression , from asthma to eczema are directly connected to the amount of good or bad bacteria that’s in our gut. And when you address the imbalances in your gut, your whole body heals. Just like Hippocrates said almost 3,000 years ago: “All disease begins in the gut.” When you heal your gut, you heal disease. I continue to be amazed at the healing success stories from people who took charge of their digestive health and gut bacteria. Aren’t these stories cool? By addressing my own digestive health and imbalances in my gut bacteria, I also experienced a variety of healing all throughout my body. 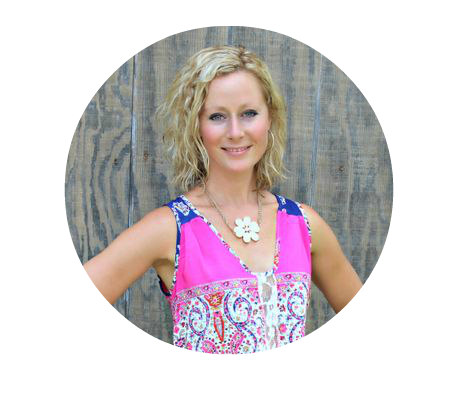 Growing up and all throughout my twenties, I experienced daily headaches, roller coaster blood sugar, raging sugar cravings, hormonal migraines, horrible PMS and mood swings. I’d also be majorly bloated after every meal, my skin was dull and dry and my hair was thin, dry and damaged. Throughout my childhood, I went from doctor to doctor and from specialist to specialist who all just put me on the latest medication and gave me no real answers as to why I wasn’t functionally optimally. Meanwhile, my health problems kept getting worse and growing in number. It was only after focusing on my digestive health and gut bacteria that I finally started to heal and thrive. Headaches? I haven’t had a migraine in years! I went from having a headache every single day to maybe one or two a year. This alone has been life changing! My PMS? None! Every month I am still amazed. Blood sugar? Stable! I can easily go 4-6 hours without eating. Bloating? I can’t even remember the last time I was bloated. Skin and hair? Vibrant, balanced and healthy! Woo! My health and how I feel before and after is a night and day difference. And my story is far from uncommon. That’s why I’m so passionate about digestive health and teaching others how to change their gut bacteria for the better! I want others to experience vibrant health just like I have 🙂 Heal your gut, heal disease. 14 Ways To Change Your Gut Bacteria for the BETTER! YOU have the power to change your gut bacteria for the better! If you are new to all this health stuff, this list below is probably going to seem really overwhelming. I encourage you to just pick one thing that is doable for you. I truly believe that the changes you’ll experience in your health just from doing that one thing will motivate you to add another thing when you feel ready. And remember: true, lasting change doesn’t happen overnight. It’s a journey that involves moving one step forward at a time and giving yourself a lot of grace along the way. So right now, pick one thing from the list below and do it this week – I know you can do it! 1. Consume probiotic rich foods just like this easy probiotic drink in your diet regularly. Other probiotic rich foods are fermented vegetables like sauerkraut and kimchi or kefir. Or take a daily high quality, multi-strain probiotic. I like THIS one. 2. Seek out a holistic practitioner who can help you assess your gut function. Oftentimes, an underlying intestinal parasite or pathogen is at the root of many health issues. Have your practitioner run stool tests to find out the condition of your gut bacteria so they can effectively treat any imbalances and problems. 3. Avoid sugars, processed foods and refined carbohydrates. These feed the bad bacteria. 4. Eat plenty of fermentable fibers (prebiotics) and a large variety of fresh vegetables . Foods like sweet potato, yuca, dandelion greens and other leafy greens, garlic, broccoli, asparagus, leeks and onion all help feed the good bacteria. 5. Avoid antibiotics unless absolutely necessary. Antibiotics wipe out both good and bad bacteria. Herbal antibiotics are a great option and very effective! They are also relatively sparing of good bacteria. I like and use THIS herbal antibiotic if necessary. If antibiotics can’t be avoided, make sure to take a high quality multi-strain probiotic afterwards. THIS is a soil based, multi-strain probiotic that I like. 6. Avoid Birth Control, NSAIDS, Steroids and Acid Blocking Drugs if possible. These all change your gut bacteria for the worse. There are effective natural options and methods available. 7. Avoid conventionally raised meat, dairy products and eggs. 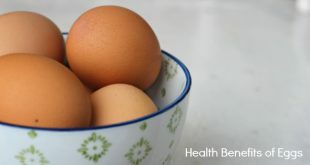 The majority of conventional meat, dairy and eggs contain antibiotics and hormones that are detrimental to gut bacteria. Instead, buy these items organic or at look for pasture raised products at your local farmer’s market. 8. Avoid Gluten Grains. The gluten in the United States is extremely inflammatory and acidic. Gluten is irritating to the gut and for most people causes an inflammatory response. 9. Use a water filter for tap water. Chlorine in tap water is known to kill microbes in soil and negatively impacts gut health. 10. Avoid artificial preservatives, coloring, sweeteners and ingredients. Not only do these things trigger cravings, but they negatively impact gut bacteria and lead to inflammation. 11. Choose more natural options in your cleaning, personal care and beauty products. The synthetic, toxic chemicals in these products negatively impact gut bacteria. 12. Take Apple Cider Vinegar (with “the mother”) before each meal. ACV stimulates your body’s digestive juices, aids in digestion and boosts your body’s good bacteria. THIS is my favorite ACV drink. It tastes so good and it’s perfect for people who don’t like the taste of ACV! Drink it before your meals. 13. Get enough sleep. Your digestive system needs plenty of restorative sleep to rest and repair. Aim for 7 to 8 hours every night. 14. Manage Stress. Chronic stress impairs your gut function and leads to all kinds of inflammation. Find something that you love and enjoy doing that helps you manage your stress. Kickboxing, a relaxing nightly bath, yoga, reading, trying something new….whatever it is, make time for it. Your health really does depend on it! 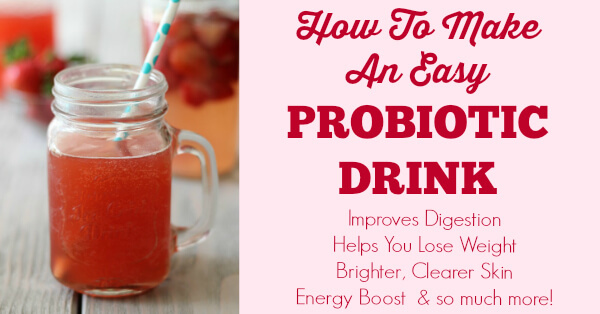 Easy Probiotic Drink Recipe that is SO simple to make! In a 1-quart jar, add your sliced fruit. Mash it with a spoon. Add in your honey and the insides of the probiotic capsules. Stir. Don't worry if the honey isn't dissolved. Fill the rest of the jar up with filtered or distilled water, leaving 1 inch of headroom. Put the lid on and leave your jar on the counter for 2-3 days. Once or twice a day shake the jar briefly. If the lid starts to bulge and gets hard, open the jar briefly to let the air escape. After 2 days, pour some of the liquid into a cup and taste it. If it's to your liking, strain out the fruit. It should be fruity and a little bit tangy. If it needs a little more time to ferment, keep it on the counter for an additional day or two. After you've strained out the fruit, keep in the refrigerator for 2-3 weeks. I just read your recipe for the probiotic drink, but it did not say how much to take, how often, and what time of the day is best. Could you please let me know the answers to this ? Hi Carrie! Thank you for bringing that to my attention – I will update the post with that information 🙂 If you are not used to taking probiotics, it’s best to start small and work up. 1/4 cup a day would be a great place to start. I drink 1 glassful a day (about 8-12 oz). Anytime of the day would be great to drink it! It does give an energy boost, so it’s best avoided too late at night. Hi Kelly! Great video! I cant wait to make this! Could swap out honey for agave, coconut sugar, or Stevia? I am trying to keep on low GI. Hey thanks, Samantha! A lot of the honey gets eaten up by the probiotics and there is minimal sugar content left after fermentation. 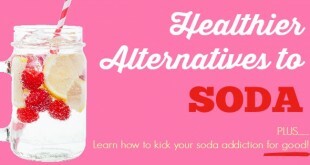 But you could still use coconut sugar or agave – just not stevia. If you find you need more sweetness after the 2 day fermentation, stevia would be a good option to stir in (only after the fermentation period, though). Hope that makes sense – let me know if you have questions! Yes, you can! Love that idea, Patricia! Thanks for another great recipe! I am always happy when you pop up in my inbox! I know when. a king the jars have to be sterilized. Is that so with this technique as well? I washed and ended my jar with very hot water in hopes of not introducing unwanted bacteria. Also – I used frozen berries – I only bought enough berries for lunches this week 🙂 my daughter saw your video with me and. Wanted toake it right away! Hi Gwen! Hope you and your daughter like this 🙂 I just rinse out and wash my jar right before making this, which is always a good idea. I’ve never formally sterilized them, though. Very interested in your probiotic drink and enjoyed the video. But I couldn’t really tell what kind of fruit you used.–kind of looked Iike apples but hoping it was strawberries. I’m allergic to apples, pears and melons. What do you suggest? Thanks! Can’t wait to try this, looks great and so easy! That looks so refreshing! Thanks for the recipe. I was just wondering, though, about the probiotics that you added. I have 35 billion CFU capsules that I use. I noticed that the ones you use are about 10 billion. Do you think I should only use one of my capsules? Is there an amount that would be too high for this recipe? Hi Shelley! Yes, you can use just 1 capsule. If you used 2 it wouldn’t hurt at all, either, but it’s not necessary. 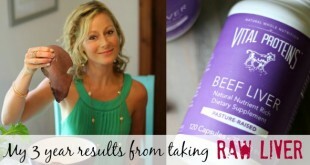 Love the work that you and Liz do over at Nourishing Liberty, Sally! I made this drink with blueberries (only available fruit in the fridge at the time). Tonight is day 2 and I tasted it– was tangy but not very sweet. Is it done fermenting or will it be sweeter if I wait a day or two? Strawberries are in season here. This drink is fabulous! Thank you! Hi Kelly! Great video!Will definitely try it!! Rob, you can do either. If you have any heartburn or digestive issues, you may find it really beneficial to consume 1 tablespoon of ACV, like this drink, before every meal. I was wondering about doing a ferment like this but use coconut water. How would you do that using this recipe as a guide? Gwen, that’s a great idea! I would just give it a try – same recipe but substitute coconut water for the water. I’m by no means a fermenting expert, but I’ve done my fair share of fermenting over the years and I’m pretty confident it would do really well. Now I want to try it! Could you elaborate on the specific benefits of making the drink, as opposed simply taking the pills? Hey Justin! Thanks for bringing this up – I need to update my post to tell about the benefits because you get so much more benefit from making the drink as opposed to just taking a pill! The good bacteria in the pill multiply and multiply when the drink is fermenting so you’re getting SO much more good bacteria than just a pill would provide. I’ve read studies and articles saying that one serving of a fermented food provides more friendly bacteria than an entire bottle of probiotic pills. That’s amazing! And then, of course, you get all the vitamins and minerals that are now infused into the water from the fruit. So yes, you could just take a probiotic pill, but you can really stretch that bottle of pills out when you make the drink. Even if you just drink 1/4 – 1/2 cup a day, you’re still getting so many more good probiotics than just one pill would provide. Hi Robin! I don’t like to take too much probiotics because you can overdo it. Too much probiotics can cause stomach upsets (especially if you are new to taking probiotics and your system isn’t ready for them) and they also can have a detox effect. If you take too much probiotics, the toxins leaving your body too quickly can make you feel almost flu-like or you may get a rash or some other unpleasant symptom. Those are all signs that toxins are leaving your body too quickly. I love hearing of all these healthy changes you are making, Robin!!! You are awesome!! I am in the process of finding the right probiotic and I found ones that are dairy, soy, gluten free, etc but are in the form of a powder instead of a capsule. What are your thoughts between powder and/or capsules? Also if I had the powder form how much would I use for the above recipe? I was looking at GUT Pro and CUSTOM Probiotics. Thanks! Hi Anne! Powder probiotics will be great for this! 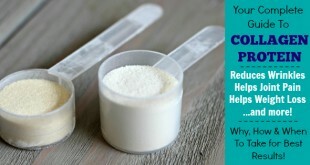 I couldn’t find info for Gut Pro, but I did find some info for The Custom Probiotics powder — you would only need to use 1 child scoop size for this recipe! That looks like a great probiotic powder! Could you substitute a vegetable?? I am not to have fruit.. I am wondering about cucumber and maybe just a squirt of lemon juice?? What other vegetables might work??? Hi Mary Beth! I am thinking that would be great – well, as great as vegetable juice can be, I suppose 🙂 I think your cucumber lemon idea sounds great. I love beet juice, so I think beet juice would be a good one to try, too. And carrot, too (maybe with some ginger in it?). I think it would taste similar to regular veggie juice, but with an added tang. So whatever veggie juice you currently like would be good options to try. Please keep me posted if you try this with veggies! Kelly, I have been making my own kombucha ever since your Mom gave me a scoby over a year ago…I am addicted…love it so much! But this looks a bit less time consuming and doesn’t have any caffeine. Can you double or quadruple the recipe and make it by the gallon or half-gallon? Hi Candy! Yes, you can! Is there a reason why the fruit is taken out or is it just to make it easier to drink? It seems like a waste of fruit. Could it just be blended together like a smoothie? Hi Alex! All the flavor and nutrients of the fruit are now infused into the water. You could leave the fruit in there, but it’s void of any flavor or nutrients at this point. All you’ll get is a little tasteless fiber 🙂 You could leave them in if you wanted, but all the good stuff is now in the water! Could a tablespoon of whey from homemade yogurt be substituted for the probiotic powder in this drink? I’m really enjoying your articles and recipes! Hi Rita! Yes for sure – that would be a great substitution! I have a couple questions. Does this increase the probiotic properties? I find this very odd that you use honey because of its antibacterial properties. I have been brewing kombucha for years and know that you can not use honey because of this… Please explain. Can you use sparkling water? That’s all I have on hand. Yes! And whey will work wonderfully, too! I bought a Woman’s Multi Probiotic (10 strains) but is also CranRich. I made one batch but I don’t know what it is supposed to look like. The capsule powder is already red because of the Cran and at the end of the two days there seemed to be quite a bit of reddish powder at the bottom of my jar. Do you think it’s working? I think it is, Naomi! Hi Sue! Yes, this is normal! It’s even normal to have a white harmless film on top like you described that you can skim off and drink the rest. Hi Kelly! I love your blog and am SO glad I discovered it! I am making this probiotic drink right now and can’t wait to try it. Quick question – you mentioned that you quit drinking kombucha because of yeast overgrowth. Will this probiotic drink cause that as well or is it safer? Hi, I love your blog! So informative and not at all intimidating! I’ve made kombucha for a couple of years, fruit kvass and other probiotic drinks with whey and I usually use organic sugar, except for in the fruit kvass which uses raw honey. I’m wondering if I can successfully use raw sugar for this or is there something in the raw honey that is needed to make the little probiotic sea monkeys multiply? I’m all out of honey. Thanks, Julie! Yes, raw sugar or any type of sugar would work well for this! Blackberry sounds delicious! Hope you like this, Eva! Could you possibly substitute tea instead of just using water? I tried the drink and it was very tasty! But the second day in it was moldy! Please help! I did keep it in the fridge after it was ready after 2 days. Hi Dova, is it a white film on top? If so, that is just harmless yeast and is very common with fermentation. You can just skim it off and continue drinking. Making this for the first time. Trying to get more probiotics into my system. My question is after straining the fruit can I use it in a smoothie or do I have to discard all together? Thanks so much I will let you know how I like it. Hi Marilynn! You can definitely use it in a smoothie. The fruit will be void of taste and nutrition, though (except for some fiber!) because all the nutrients and flavor are now infused in the probiotic drink. But a little extra fiber for your smoothie will still be great and a nice way to use the fruit! This is very interesting. I also like to stretch my probiotic pills by using them to ferment things. The easiest one is milk. They do not make yogurt, but they will ferment the milk and cause it to separate into curds and whey. Both the curds and the whey are full of Lacto bacteria. They taste sour, but not horrible. I just eat them anways, to get the extra probiotics. I have even saved some of the whey and used it as a starter to start a new batch of milk or fermented veggies, and since the bacteria in the whey are already at room temperature and already awake, they ferment the new batch of milk or veggies very quickly. Usually within a day or two at the most. Also, I just ferment them at room temperature. I don’t heat the milk at all. I just take it straight out of refrigerator and add the whey and it works every time. So cool, Jeff! Thanks for all the tips! Hello! Love your post. I’ve been trying to find a cost effective and easy way to make probiotic drinks as I love drinking Kombucha and WCV every day. Question- can I use ginger and lemon juice instead of fruit juice? Yes, definitely! I love that idea! Thank you for the video! Do these drinks taste tardy and some what sweet? I think that’s a great description of how it tastes, Clark! I think I like this idea better than kombucha but I wanted to know if there was a way to start with a more neutral base (like in kombucha) and then build other flavors from the base. Any suggestions would be appreciated. That’s a great idea, Mya! I haven’t tried it that way, but you’ve inspired me to give it a whirl…I really don’t see any reason it wouldn’t work 🙂 Here’s what I’m going to experiment with: I’ll skip the fruit, use brewed tea instead of water and double the honey (or sugar if you prefer to use sugar) just so the probiotics have enough to eat. After it ferments, I’ll do a 2nd fermentation with that base, adding in some diced fruit and herbs. I’ve been stumbling across a page (http://findyourbalancehealth.com/2013/12/wildfermentedfruitykvass/) where they suggest to do the same as in your recipe, and get similar results, but even without any starter culture – not even the probiotics capsules. Have you ever tried such a thing?